Had an idea for a little side experiment. where having large commercial support isn't a huge deal. Anyone ever do 2ft gauge using N scale track ? The exact math works out to 1/68 scale, for which there is nothing. either of which could be "fudged" as a match. ... don't forget the british OO9 (1:76 on 9mm), and 5.5 scale (1:55 on 12mm). Not really in scale, but maybe you find suitable parts. 55n3 solved the scale/gauge problem of HO track for three foot gauge. Don't follow everyone, think outside the box. The reason for 5.5mm/ft on 12mm gauge is the Talyllyn and Corris Railways in the UK which were 2'-3" gauge which works on 12mm TT gauge track. When one is considering an "oddball" combination of scale/gauge, the amount of usable figures, autos, and animals should be given primary consideration. Small errors in the gauge go unnoticed, and the smaller the scale selected becomes, the more difficult the error is to detect. Unless you want to spend a lifetime scratchbuilding and sculpting, stick with one of the long established scale/gauge compromises. Holy Mackerel, I will jabber a bit also! You can have 2 footers in S (1:64) scale using available HOn3 loco mechanisms and trucks...there are locos (expensive brass) and cars (expensive resin & wood kits) or just make stuff yourself and use HOn3 track. If you had some HOn3 stuff and would consider a slightly narrower gauge, using O scale, that HOn3 gauge becomes 20" gauge. And then there is 2 foot gauge in 1:35 (military scale) using HO, On30, 16.5MM gauge. I know a couple of dudes doing that now.I also know more doing On20 also. And yes, I know some Sn2 modelers.I can get shot for suggesting this but you might consider using already established and available materials for your venture. Locking yourself into something like 1:74.285 or 1: something something will cause you to give up in disgust because no figures or vechicles are available. Depending on what type of 2 footer you would like makes a difference also. Do you want British/European tramway stuff? Do you want Aussie/NZ stuff? How about US stuff-Maine types, industrial lines, or as I love-western US 2 footers. As for a small layout, look here in the micro layout section for ideas. Using tiny locos and cars, you can have a neat little line in a 1 foot square layout! Stuff to think about. I do know a little about 2 footers and what I don't know, others will...just ask. Your problem won't be vehicles,figures and buildings, there are enough 1/72, OO and HO that can be converted. The key to an "oddball" combo is mechanisms, railway bogies and drivers. If you can find those it will always work. Im with everyone else, you could easily fudge a little with S scale details. People get way too hung up on scale! Yep-in S scale, that N gauge becomes 20" gauge...just right for a real mining operation. Check out the CORONADO RAILROAD in AZ, it just might be what you want. You could make a modern line using a great running N diesel all "fixed up" with some HO and S scale parts and an S scale engineer hanging out the cab. Is that enough "outside the envelope" for you? 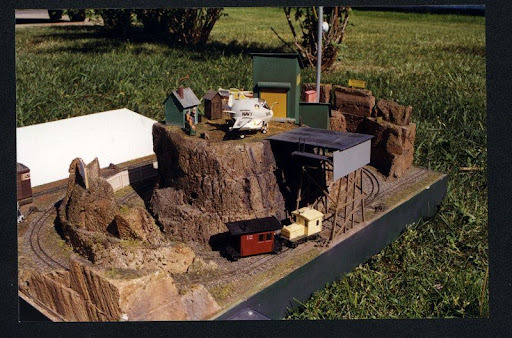 Here's my first micro layout from around 1995 - S Scale, N gauge (HAND LAID!!! ), about 20" x 30". Had a running loop, interchange track, mine branch and an airport. There was an enginehouse built from a standard gauge boxcar. The airport was on top of a mesa and was for flying out special Cavorite shipments directly from the mine. The first Cavorite conversion aircraft was a Harrier and the Marine pilots did just fine; when we converted an A6 Intruder we had to add the flight deck for the Navy jocks. For N track now I recommend Peco Setrack, the turnouts are 9" radius and 2 truck diesels run thru them just fine. @Herb -- Yes, wheel base was something I was considering. My thought was to use HOn30 trucks. The wheels on the loco mechanisms might still prove to be problematic. @Woodie -- 1:35n2 would be cool, but space is a larger concern to me, and that's why I was looking at 9mm/N track. I was aware of the O running on HOn3 track. It is a nice combination, but my only concern was the availability of mechanisms. With 9mm/N at least I can always fall back on the Kato "pocket" line of mechanisms. Is there an easily accessible mechanism for HOn3 track, or are you re-gauging HO locomotives? Otherwise, I think (with your second post) you captured the spirit of where I was going -- A small little arizona/colorado line. @Russ -- Wow, awesome. That is really close to what I had in mind for my project. 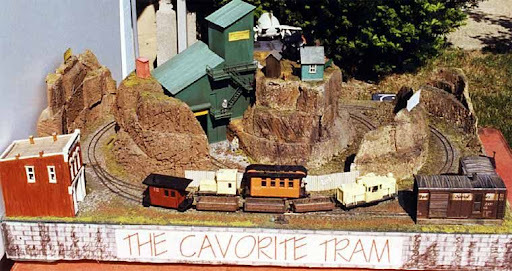 I actually saw that posted on the small layout website, but didn't catch it was S scale on N track. Even your construction methods -- Pink foam with extremely tight hand laid turns is what I was thinking too.